Testing sites for SSL certificates in development is important! Let's cover how to create and install self-signed SSL certificates in Apache and Nginx. As you're likely aware, being able to send data securely over a network (especially a public network) is of growing importance. To that end, many web applicates employ the use of SSL certificates to encrypt traffic between a client (often your web browser) and a server (someone's http server). If you're interested on learning more about SSL certificates and the various mechanisms (such as "key certificates", "root certificates", "intermediate certificates" and more), jump to about ~51:45 of this edition of Tech Snap. I really recommend watching that portion of that video. Seriously. In production, you will have to purchase an SSL certificate. When you purchase an SSL certificate, you are paying for a recognized and trusted-third parties (root or intermediate authority) to say that your SSL certificate is both valid and legitimately used by its owners. 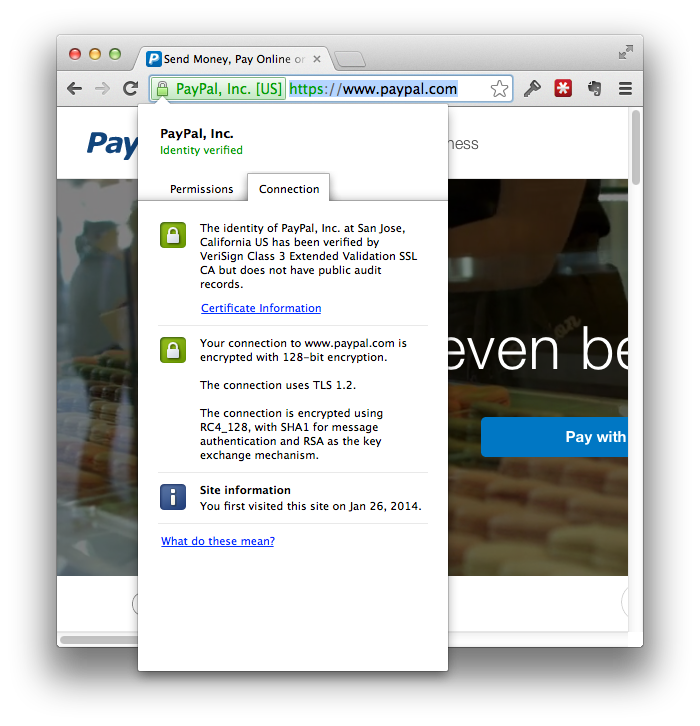 See how PayPal's SSL certificate was verified by VeriSign. That means you want to have a way to test your applications with an SSL certificate in development, instead of waiting for your site to launch to find out there are issues. Unless there are some extenuating circumstances, you shouldn't need to buy an SSL certificate for use in development. Instead, you can create a "self-signed" certificate, which will work in your local computer. Your browsers will initially give you a warning for using an un-trusted certificate, but you can click passed that and test our your web application with your own SSL certificate. At the time of this edition being released, there happens to be a nasty OpenSSL vulnerability called The Heartbleed Bug. OpenSSL 1.0.1 through 1.0.1f (inclusive) are vulnerable. This means 1.0.1g and greater are fixed. You should see if any of your servers need updating. You can use this site and this site to test if your site is vulnerable. The Common Name option is the most important, as your domain used with the certificate needs to match it. If you use the "www" subdomain, this means specifying the "www" subdomain as well! I left some blank. You can skip Organizational Unit Name and Email Address for a self-signed certificate. I also choose to leave the "optional company name" field blank. Finally, I elected NOT to add in a challenge password. This is something used by the certificate authority (if you're purchasing a certificate) in the case you need to regenerate an certificate. So, we now have example.key and example.csr files created. Let's finish this up by creating the self-signed certificate. I use the xip.io service so that I can avoid editing my hosts file when I use local development servers. It's useful to automate the process of creating a self-signed wildcard xip.io certificate for my local servers. Let's create a wildcard subdomain. I'll also show you how to do it in a way that can be automated, eliminated the need for human interaction. sudo openssl x509 -req -days 365 -in "$SSL_DIR/xip.io.csr" -signkey "$SSL_DIR/xip.io.key" -out "$SSL_DIR/xip.io.crt"
The above script follows all of our previous steps, except it does some fancy bash scripting so we can automate passing in the CSR generating variables using the -subj flag and some string parsing. 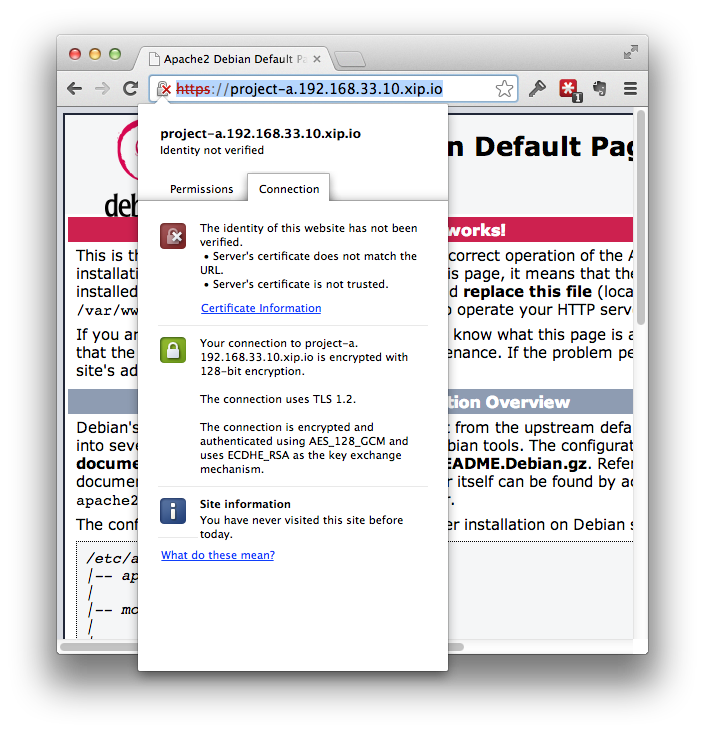 Then you can see those generated files in /etc/ssl/xip.io/. Now that we've generated some certificates, let's see how to use them in our favorite web servers. Next, we need to modify our virtualhost to accept https traffic on port 443. More information on configuring Apache Virtual Hosts is found on the First Edition under "Configuring Apache Virtual Hosts". And that's it! Once you have that in place and enabled, you can reload Apache's config (sudo service apache2 reload) and try it out! If you are using a self-signed certificate, you'll still need to click through the browser warning saying the Certificate is not trusted. Let's see what that looks like for the wildcard xip.io setup. The following virtualhost is for a web app located at project-a.192.168.33.10.xip.io, where "192.168.33.10" is the IP address of the server. After that's setup, you can reload your Apache config (Debian/Ubuntu: sudo service apache2 reload) and test it out! Here we can see the SSL certificate working, but of course our browser doesn't trust it since it's not certified by a trusted third party. That's fine tho, we can still test our application's use of SSL. "Server's certificate does not match the URL." - And here we thought we made a wildcard certificate! Well, it turns out that matching wildcards isn't supported the same across implementations/browsers, especially "sub-sub-domains" we use with xip.io. Read here for some more information. These server blocks can be in the same configuration file or in separate ones. That's completely up to you. Just remember to symlink any configuration files to the /etc/nginx/sites-enabled directory if they need to be enabled. And that's it! Once you have that in place and enabled, you can reload ngin (sudo service nginx reload) and try it out! Vaorobash Nginx install, including the certificate. DigitalOcean on Nginx and a self-signed certificate. If you want to see a more complete Nginx server block, check out the Third Edition, Nginx Instead. -nodes - Rather than "nodes", read this as "no des". Since we're doing this in one step, don't encrypt the Private Key (since it may require a password). Read more here. You can see the process of automating the creation an SSL certificate (no user input needed) in this shell script in the Vaprobash project.